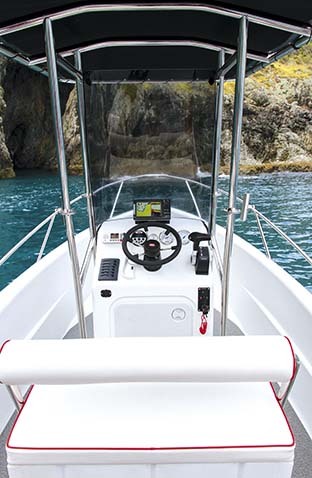 Trade-a-Boat tests some of the best trailerable fishing boats in New Zealand, this time the Mac 600 Centre Console. Generally, "tough" and "easy" are two words that don’t belong in the same sentence, but before the grammar police arrest me again, let me explain: Mac Boats are manufactured using a patented Gyro-Tech process, creating a double-skinned outer shell that’s both tough and exceptionally easy to look after, or abuse if you feel the urge. That armoured shell is actually plastic, or polyethylene to be precise and is said to be up to five-times more impact-resistant than fibreglass. Unlike fibreglass or aluminium it’s actually positively buoyant in its own right. Mac Boats takes it a step further and fills all the available internal voids with closed-cell foam to create a stable and virtually unsinkable ride that’s also exceptionally quiet and safe on the water. Mac Boats have done some horrible things to a couple of them on their website – involving shotguns, cranes and oyster-covered rocks to name a few. But like rust, the boats survived – except they don’t rust, oxidise or need repainting ever. The thermo-formed plastic possesses an attractive, comfortable and extremely durable finish. This durability makes it ideal for fishing and diving as stray sinkers, heavy dive tanks, clumsy mates and smelly baits can’t leave a lasting impression. While it’s tough it’s also kind on those aboard, with a softer and less temperature-conductive feel than the alternatives. 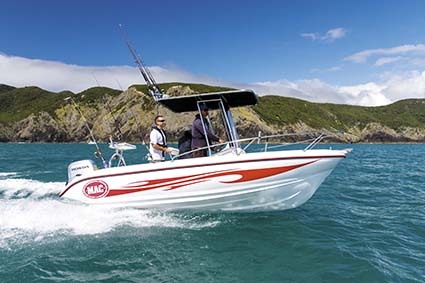 Mac Boats are built to Marine Safety Authority (MSA) and US Coast Guard standards and the company is one of the few NZ boat manufacturers that has also achieved CE certification for export. In fact, Mac Boats are exported far and wide, including places like Malaysia, Kuwait, Dubai, Korea and Australia to name a few. There is also a new dealer in Queensland. As far as layouts go a centre console is hard to beat. The open design makes this room-with-a-view ideal for jigging, soft baiting or kicking back with a juicy bait cast out the back. It’s not essential to have the wind and tide perfectly aligned when stray lining baits either as you can comfortably fish from all angles. A raised casting platform in the bow doubles as an easily-accessible anchor locker for hassle-free deployment. Once the minimal manual labour is done you can kick back in the comfortable front-facing seat to enjoy the view, with rodholders close to hand. I’m told that three aluminium dive tanks per side (six in total) can be safely stored in the underfloor lockers at the rear of the cockpit. Access to the water is easy with the knee-high stern gunwales offering effortless passage. While the low rear gunwales and lack of footholds aren’t ideal for venturing out wide, you only have to walk forward to enjoy the extra security of the stainless steel bowrail and high gunwales in the bow when fishing in chop and swell. The Trade-a-Boat team had the pleasure of eloping with this boat for two days fishing and adventure as part of our Kiwi King’s feature in the beautiful Bay of Islands. We took turns onboard each offering and our group of salty die-hard anglers all commented on how easy the Mac 600 was to fish from. 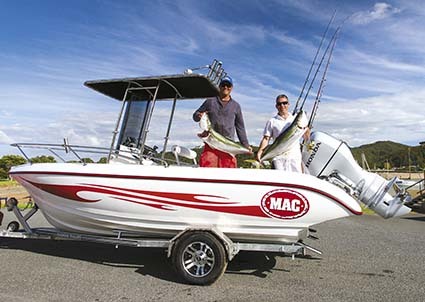 It was the only centre console (and non-aluminium hardtop) boat on show and Mike and Mark from Mac Boats certainly proved its fishing prowess by nailing a couple of solid Kingfish on jigs. Beneath the console the storage compartment extends beneath the front seat, maximising its internal volume. A further oversize bin lurks beneath the double-width helm seat and neatly kept our tackle boxes and sandwiches out of the way. The T-top is both solid and more protective than your ex-girlfriend’s father, with further elemental protection afforded by the large tinted screen. We found the front underfloor locker useful for stashing the catch, while go-to tackle was kept close at hand in the pull-out tackle drawer. Afterwards, the Jabsco saltwater washdown pump (which neatly tucks away under the floor) came in handy to deal with the mess. 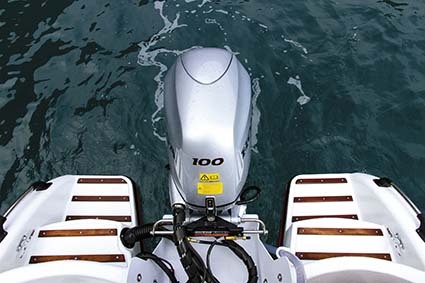 Our Mac 600 also had a brand-new super-smooth Honda BF100A four-stroke outboard, which impressed as much in its fluent motion as it did in its quiet demeanour. The two were the perfect partner for wash-fishing around the Hole in the Rock and surrounding coastline – with the full walk-around layout proving invaluable for casting soft baits into the wash from all directions. The fuel economy stats speak for themselves and if it weren’t for the rev counter, you’d swear this quiet engine and hull combination was only doing 3000rpm rather than the actual 5000rpm we were clocking when I glanced down at the rev counter. Smooth is definitely an understatement. Thanks to the lightweight plastic construction, and Honda’s cutting edge technology, this frugal combo is using less than 0.8lt/nm at cruising revs, which is good value in anyone’s book. 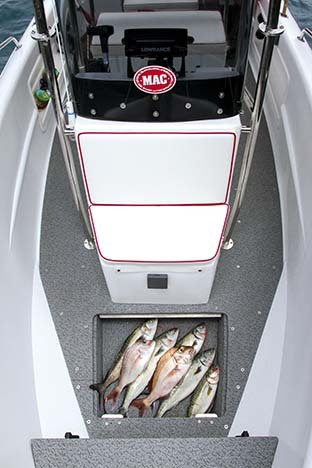 Insatiably tough and fantastically fishable, the Mac 600 Double Centre Console is tough yet kind on those onboard. Its beauty lies in its simplicity and the ‘plastic fantastic’ factor adds up to a quiet, buoyant, tough and virtually unsinkable ride. Maintenance and fuss are kept to a minimum, while peace of mind safety, value for money and stability are maximised. Fantastic plastic? Why yes, I think so. Mac 600 Double Centre Console and 100hp Honda four-stroke outboard with 13.5 x 15in stainless steel Solas propeller. *Sea-trial data supplied by the author. What were the other New Zealand boats showcased in the Kiwi Kings feature? Check out these top trailerable fishing boats. See the full feature in Trade-A-Boat #241, on sale June 5, 2014. Why not subscribe today. Find Mac boats for sale.